WASHINGTON — Television viewers on Easter weekend will be pulled from the Old Testament on Holy Saturday to the New Testament on Easter. And it’s not just because the boss says so, either. 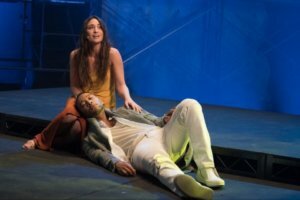 “All of us, individually and collectively, have a long love affair with ‘Jesus Christ Superstar,'” Meron told Catholic News Service in a telephone interview from New York March 27, the first day the full cast had come together for run-through rehearsals. The show stars popular singers John Legend as Jesus and Sara Bareilles, who was raised Catholic, as Mary Magdalene, and features 1970s rock figure Alice Cooper as Herod. Cooper was the final cast member to join the rehearsals, after having recently completed a tour. “But he’s in only one scene, so that makes it easier,” Meron said. One example was Legend, who had a key supporting role in the 2016 hit “La La Land.” “We were able to work with John and his team to create a rehearsal schedule that allowed him to tour and work on the role. It’s always a challenge, but we found out over the course of a year, more and more people are interested in doing these shows,” Meron said.